The 2018 Los Angeles Dodgers are back on path to winning another NL West Title. That will all be fine and dandy, but if they don’t get back to the World Series and win, it will be seen as another failure. The organization continues to use their stacked farm system to develop talent for their own club, in addition to using several pieces to acquire talent for the big league roster. While many top prospects have graduated or been dealt away, the Dodgers still own a top 10 system. There is not much more for Mr. Verdugo to prove. He continues to rake at the AAA level, .349/.396/.506, all while easing concerns about his one weakness as he has begun to hit with more power. He is simply a man without a spot in LA, at least for now. Ruiz has ran into a small bump in the road as his numbers have dipped a tad while being challenged in AA to start the year. He’s still an elite catching prospect, as his appearance in the All-Star Futures Game speaks for itself. “Gingergaard”, is no longer the Dodgers best kept secret as he has seemingly had his “break out”. Rumored to be desired in the Machado deal, the Dodgers held strong and kept him. While he still could be traded for a player with more control, I suspect May will be in Dodger Blue for a long time. Smith continues to show encouraging power for a catcher that should stay at the position. 14 doubles and 19 home runs to go along with a .362 OBP should leave baseball fans excited for Smith’s future. White has dealt with injuries all season, which have skewed his numbers. However, as he gets healthy, his stuff has begun to tick back up and I’m looking for a strong second half for White. He’s still right up there with May as the best Dodgers pitching prospect. Lux has taken huge strides this year with the bat, which is why he took a huge 9 spot jump in the rankings. He’s getting on base at an elite rate (.393), while also showing increased power 39 XBH (11 homeruns). Another reportedly highly coveted Dodgers prospect amongst other teams, LA has shown resistance to include him in any deals to this point. Santana breezed through AA and AAA (65 K’s in 50 IP), before earning a promotion to Los Angeles when the Dodgers were starter needy. Santana injured his shoulder after a couple of appearances and is still working his way back. Don’t let the recent injury slow your excitement of Santana’s upward trend. Ferguson continued his rapid rise through the Dodgers system as he currently sits in the Dodgers MLB bullpen. After three rough starts, Ferguson was moved to the bullpen and has done well (20 IP, 3 ER, 14 hits, 2 walks, 25 k’s). Ferguson is still a starter long term, but the current MLB need is in the pen. DJ continues to mash baseballs with 40 XBH (2o HR’s) already. If he cuts down on the K’s a bit, more hits will fall and those BAA/OBP numbers will rise. He’s still young and has time to come into his own. MASSIVE potential. Tools, Tools, TOOLS! The swing and miss is still a huge concern, but can’t help but see that 30/30 potential and salivate. He’s more likely to end up as a solid to gold glove defender with 15-20 HR’s, 30 SB’s and a .240 AVG. That still plays in todays game. Rios is still hitting with power and getting on base at a good rate, but he’s still a man without a legitimate defensive position. He’s fine at the corners, but probably better suited to play for an AL team so he can be a 1B/DH type. The bat will play though. I’m sure the Dodgers hold partial regret for not maximizing Alvarez’ value via a trade when his stock was at an all-time high 1-2 years ago. As his control continues to be an issue, his stock drops. There is still massive potential here to be a high K #2 starter or dominant late inning reliever. Gonsolin has always put up solid numbers, but this year he has stepped up his game and has officially become a “DUDE”. 132 K’s in 102 IP to go with a 2.72 ERA and 1.14 WHIP, he is now on the radar. He could move quickly and reach the majors by 2019. The Dodgers 2018 2nd Round Draft Pick out of West Virginia has yet to throw a pitch in a professional ballgame. He recently underwent TJ surgery (a Dodger theme), but showed elite “stuff” prior to. The Dodgers will fire him up as a starter to begin 2019. The Dodgers 2018 3rd Round Draft Pick out of Hofstra is a large lefty that the Dodgers hope to develop as a starter. However, he has the fastball/slider combination that could help him move quickly as a reliever. The Dodgers just signed the #1 overall international free agent for this signing period, according to MLB Pipeline. 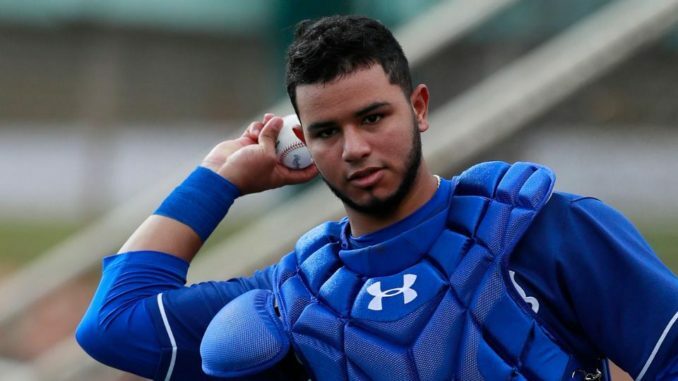 Being a large catcher from Venezuela, he naturally receives comparisons to Salvador Perez. While he is only 16, he has shown scouts enough to be highly praised. Wong has shown surprising power this season, seemingly at the expense of his AVG/OBP numbers. I think the true Wong lies somewhere in between what he was thought to be and what he is this season. He should be a solid MLB utility-type or even a regular if all goes well. Fisher, the 4th Round Draft Pick out Clear Falls HS in Texas is just the type of high upside, good bodied young arm teams want in their system. I’m excited to see this kid develop. The 2017 13th Round Draft Pick has come out of nowhere this season and put up “out of this world” numbers. 95 K’s in 54 IP is just pure filth. He has a real shot to be an effective late inning MLB reliever. Sheffield has honestly done nothing but disappoint since the Dodgers drafted him in the 1st Round in 2016. #20 is too high of a rating if the Dodgers continue to trot him out as a SP. I think he could be a top closer if the Dodgers finally accept it. Heredia has taken a step back this season as he is striking out at about a 40% clip. The bright side is he’s young and the power/speed combination is something to get excited about. Uceta, a small dollar signee out of the D.R., is also small in stature at 6’0″/155 LBS. Uceta hovers in the low 90’s, with an absolute filthy change-up that has helped him strikeout over a batter an inning this season. Santana is still hitting with power, but his overall numbers have dipped as the K’s are still an issue. He still profiles as a power hitter with plus tools. Farmer has done nothing but impress in AAA and his time in the Majors. There is simply no room for him now, but he should be on an MLB roster somewhere. A little old for a “prospect”. Estevez had an interesting power drop from 2016 to 2017. However, his power is back in 2018. His overall numbers are similar, with a noticeable increase in XBH. His stock is trending up. Injuries have stalled his season, but Beaty still can swing the stick and projects as a solid utility, bat first type in the MLB. Jackson was continuing to show improvement with his new approach (.271/.369/.477 with 31 XBH) before taking a pitch off of his face and landed him on the DL. Robinson is still surprising me to this day. He does it all and should contribute with the bat and on the base paths when he reaches the majors sometime in 2019. Brito’s glove has never been in question, it’s always been about the bat. While they are moving him along slowly with his third year in Rookie ball, the bat is finally coming around. Oritz was signed by the Dodgers during last seasons international signing period out of the Dominican Republic. So far he looks good with a 70/14 K/BB rate in 63 IP of pro ball. Tools are off the charts and he’s performing very well this season (.413/.474/.618), granted it’s a small sample size. Keep a close eye on this guy. Last year’s 2nd round pick has still yet to throw a pitch in a game for the Dodgers. As a TJ survivor, this is a bit scary. However, when/if he gets healthy, he still projects as a solid #3 starter. Locastro continues to put up solid numbers in AAA. Like many Dodgers prospects, he simply is in the wrong organization. He is the ideal utility man that can get on base and steal bags. Jimenez is another power arm for the Dodgers that’s striking out over a batter an inning. The Dominican righty has a chance to advance quickly. Weird. The Dodgers finally listened and moved Sborz to the pen, playing true to his stuff. Sborz will be a good resource for K’s if he continues to see time in the pen. Thomas has made positive strides this season as he has already hit 15 bombs to go with a solid stat line (.275/.343/.485) This is a solid improvement from last year. A Ball has hit Cuadrado like a ton of bricks, smack in the face. I still believe in the overall tools, but this season has been discouraging. I was a bit bullish on Rincon as the season began. He has cut down on his K’s and is getting on base more, but it has hurt his overall power numbers. Scrappy, gamer, grinder…they all describe Amaya. The local kid was an 11th Round Draft Pick last season out of West Covina, CA. He has the glove to stay in the middle infield and if he continues to hit like he is this season, he will shoot up the rankings. Overall numbers are good with a high K rate (47 K’s in 33 IP). Projects as a solid starter once he gets the walks under control. Scavuzzo has always excited me, going back to when he was drafted in 2012. He has recently struggled with the bat, up until this season. He already has 39 XBH (20 HR’s) and is getting on base at a decent rate. Here’s to hoping he’s a late bloomer. Sopko, the Dodgers 7th Round Pick in 2015 has had a solid minor league career to this date. While it feels he has been around forever, he is still only 23 and continues to improve on his command. He projects as a solid back end starter. Casey has struggled with his promotion to High-A ball, but that’s to be expected. The bat still plays and I still see a major sleeper here. Walker is a power hitting corner infielder with an .916 OPS and 18 bombs already this season. Dodgers drafted Reks in 2017 in the 10th Round and he has quickly advanced to AA. He is a legitimate bat, without much power but that could develop over time. Slashing .311/.381/413 in 395 professional at bats. Power reliever with an electric arm. If he continues at this rate, he’ll reach the majors in the second half of 2019. Joe is already on his third organization after being drafted in the 1st Round in 2014 by the Pirates. This seems to be the first year he has been able to get it together as he is mashing in AAA. The story kind of reminds me of another recent Dodger, Max Muncy. Hulzier, AKA HR Derby Champ, is your 2018 power hitter. He smashes baseballs and walks….a ton. If he continues to do so, he could be a guy to watch. Vargas is a control pitcher with stuff good enough to advance as a starting pitcher. Crawford is a hard throwing lefty that probably best projects as a solid reliever.